Customer Review, Motobecane HAL eBoost: Scott F.
"...great job…I own 3 bikes that cost over $9000 each and I had more fun on this (HAL eBoost) bike than I’ve had in a long time." "Just a quick note to let you know how pleasantly surprised I am at the quality of this new Ebike (HAL eBoost). You’ve done a great job…I own 3 bikes that cost over $9000 each and I had more fun on this bike than I’ve had in a long time." 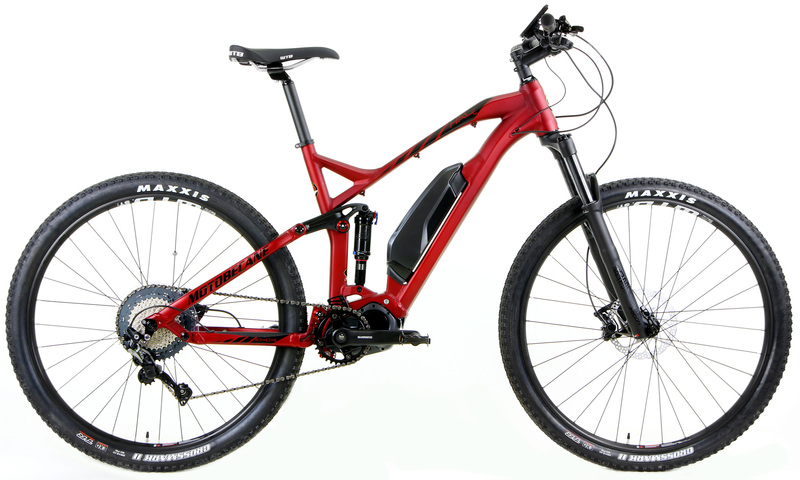 This is the much anticipated BOOST 29er, Electric Mid-Drive Bike with Boost Axles HAL e29 (Highly Active Linkage) by Motobecane USA. Building upon over a decade of FS design, this HAL eBOOST 29er Full Suspension is designed for up to 120mm of terrain taming travel both front and rear. The HAL Linkage uses a chainstay mounted pivot for even more supple suspension tracking and incredible control even while applying the brakes. Chainstays are optimized on the HAL e29 models for incredible Billy Goat climbing and traction. Explore New Grounds with Shimano STEPS e-MTB - intuitive e-MTB system for ultimate fun and freedom. Ride further, faster, longer, while still training your fitness and honing skills. For you trail chasers out there. Ride down forest paths, mountain ridges and breathe in the scent of freedom. Shimano STEPS MTB makes climbing easy. Light for easy handling. Levels the field for riders of all skill levels. Taking you places you couldn't reach before. Shimano is the Leading Manufacturer of Bicycle parts and Top Tier in eBike technology = best warranty and support and best integrated systems. Shimano says this about the E6100 Steps technology: MORE POWERFUL / Efficient "increased rigidity and better power transfer. These combined improvements reduce drag to give a 20% increase in motor efficiency so you can travel further per charge"
LIGHTER too: "...took the weight down to an extremely low 2.88 kg, saving 210g from the previous"
BAV "…very happy with it. Engine works great…Works great for technical stuff, especially the torque based power in trail mode. Boost is great for really steep climbs. I can recommend it definitely!﻿"
CC H. MTBR.com "I did another really technical climb on my hal 6 pro...I made it way further than I ever have on any other bike. Its narrow, rocky, rooted, and steep and even I was amazed at what I made it through. Part of the advantage of this bike is the high pedal clearance. I could also feel the back just sticking down, never spun out once even when leaning forward. I attribute that to the suspension, and the nice tires. The feeling of the bike under me is light and stiff. I assume the hal5 will climb better than the hal 6 because of a steeper head angle, and less travel front and rear. I will be doing a direct comparison with my friends stumpjumper FSR comp. the frame angles and measurements are almost identical on paper except for the seat tube on the Hal being steeper by 1.5 degrees…"
Imagine the trails you will dominate with massive traction, fast rolling 29er Tires and a Rockshox RECON 120mm up front with up to 120mm of travel front and rear. Test riders Compare the HAL e29 to Full Suspension bikes like a Pivot or Santa Cruz. They say the HAL e29 is a turbo-charged Pikes Peak Rally car. The Salsa Bucksaw would be more like a logging truck. 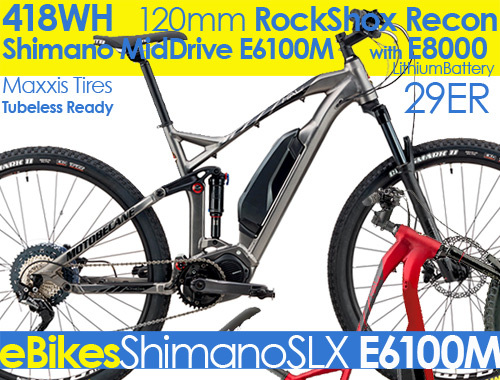 No corners are cut, the HAL e29 Shimano E6100M Electric MidDrive has top-of-the-line Full Race specs. A 120mm Rockshox RECON 29er/29er e29 fork with up to 120mm of travel + in the rear, the NEWEST Rockshox MONARCH Air rear shock with Rapid Recovery Rebound Technology. Rockshox are rated as some of the best, if not THE Best forks Period! The HAL (Highly Active Linkage) Design represents the top of the food chain. Super supple. Climbing, descending and braking with more control than ever. The HAL e29 Series features shorter chainstays than ever before = Billy Goat climbing ability and traction. With the HAL e29 series, you've got an incredibly capable full suspension mountain bike that'll do just about anything for Thousands less than any other bike. What is Boost: The HAL e29 is a Boost spacing mountain bike. Boost is a new dropout standard designed to widen the hubs on the previous standard MTB spacing wheels. The rear axle is wider by 6mm to 148mm and the front axle by 10mm to 110mm. Wider flanges = wider bracing angle for spokes = a stronger and stiffer wheel. Allows the use of 29er wheels with higher strength and stiffness for top performance. Also, More tire clearance, ability to use 27PLUS tires and with shorter chainstays for superior handling and climbing. Hang with virtually anything on the trail. Super efficient and super fast. Conquer the trail. 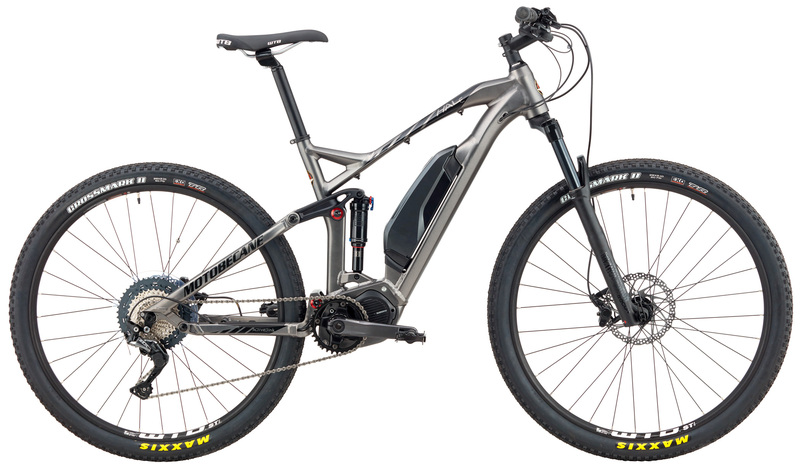 The HAL e29 is a turbo-traction, climb and descend just about anything on the trail mountain ebike. Some says it's a Boost XC Rocket! 40cm - 5'5" to 5'8"
46cm - 5'8" to 5'11"
Hubs F/HUB	JTECH	D791SB-B15-110 FRONT DISC HUB, 2 SEALED BEARINGS, 14*32H , POLISH ANO BLK, LASER-ETCHED, F/HUB THRUAXLE ROCKSHOX	BOOST 15x110 MXL LITE.